This CD sort of does double duty - you've got some lady-driven call-response singalong tunes (which would probably sound just fine without the viola that plays along through the whole thing). And you've got some viola-driven chaabi tunes and riffs that give that desired wedding/party ambiance - in particular, track 6 which feature what sounds like someone doing rhythmic-percussive footsteps on a qaâda (the metal basin that dancers climb onto during weddings or performances, to let their feet sing). But back to the CD. Personally, I prefer my call-response women's songs with percussion-only. But I understand the irresistable pull of the viola - the chaâbi ambiance-animator supreme, and it works alright here. 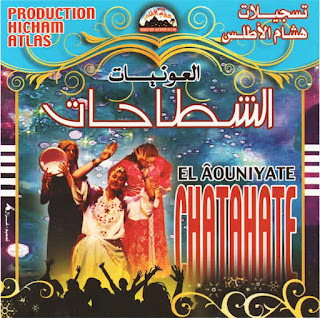 What surprised me and worried me on my recent trip to Morocco, is that when hunting for tapes of the great âbidat errma genre in and around Beni Mellal, I was told by all tape sellers that nobody was recording it anymore with its traditional percussion-only ensemble - the only recordings I could find featured violas in the group. Stupid me, I was so disappointed that I didn't pick up any tapes of that. It would have been interesting (he says, donning his ethnomusicological hat) to compare older tapes of the genre with what's calling itself âbidat errma today. On my previous trip in 2006, the trad stuff had become quite popular, and there were loads of young men playing playing in âbidat errma groups in the Beni Mellal area. I've got some vintage âbidat errma I'll drop on ya one of these days. You've never heard a pair of scissors played so funky!! By the way this CD and many tapes I got on this trip come from the production house Hicham Atlas. Their product lists no address - only a cell phone number. I'm guessing they're located around the greater Beni Mellal-Tadla-Khouribga-Fkih ben Salah area. Good stuff! The viola is a strange stringed instrument, Tim. Some musicologists (classical and none such) compare its sound to a "human sperm". Weird. I listen to Mamani Keita's 'Yelema'. What other call and response music do you know (women and percussion)? Hey, do you have any information on a date as to when this was made?